From the director of 'His & Hers', Ken Wardrop's, 'Making The Grade' tells the tales of students and their beloved piano teachers from across Ireland. The heart-warming story displays the transformative power of music and the pride and happiness it provides both the students and teachers. "It's been very special for all involved in this project to witness so many people embracing our film. The feedback has been truly amazing. It was such a wonderful experience making it and now to see a larger audience getting an opportunity to see it is very exciting." 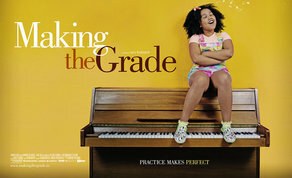 Produced by Venom Films, Making The Grade had its cinematic release in April, 2018. It will be available On Demand from iTunes, Virgin Media and Volta on 14th September. DVD stockists include Tower Records Golden Discs, Eason stores and Amazon.